Are you ready to see one of the Toys R Us hot list toys that kids are begging for? Then check out Moshi Monsters Moshling 3-Pack Mini-Figures from Spin Master, perfect as Christmas stocking filelrs, or an add-on birthday gift! Moshi Monsters all started three years ago when a company launched an online game using social networking that was safer for kids. But not just any online game. This was a social networking game that kids can join and send (and receive) messages that are filtered. The Moshi Monsters web-based game was created to be fun, was educational and it was created with children's safety in mind, which is why parents are also a big fan of the associated toys. In the game community, kids can engage in social networking (only with parental consent) where the content is checked by moderators. In the network, your child gets to create a network of others who are Moshi Monster users. The network is great because itís an alternative to those social media sites where anything goes and your child might be exposed to content that's inappropriate. In the network, kids can play games like learning puzzles and theyíll engage in games that will help improve their vocabulary and math skills too. As they play, they earn what's called Rox and they can use that to buy stuff for their monsters. 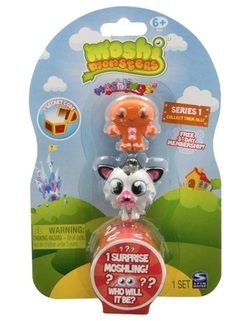 This is why kids all over the world want Moshi Monsters Moshling 3-Pack Mini-Figures from Spin Master-because of the interaction and fun they get from the online part of owning the toy. When you buy the toy, your child will get a three-day membership (at no additional cost to you) to the Mpshi Monster website as well as collector card. In this package, kids get three of the Moshlings and one of them is a surprise figure. Kids also get a code so they can get a special gift item in the online world. Kids will get a virtual room for their monster and using the free membership, can have up to two monsters in their room. These are so cute and fun for kids to have. Playing the games enables kids to look out for their monster's status in three areas - the monster's health, the monster's mood (for example melancholy) and the monster's happiness. Since the game is a safe, fun and educational toy, it's a huge hit with families of young children. Got a Moshi Monster fan that loves to cuddle? See our Moshi Monsters talking plush toys - perfect for bedtime!